Pyramid’s Cycle Club Participates in The Santini Lincoln Grand Prix Sportiv. Mark Willson dusted down his pushbike and took on The Santini Lincoln Grand Prix Sportive, along with over 1,300 other pedal pushers. 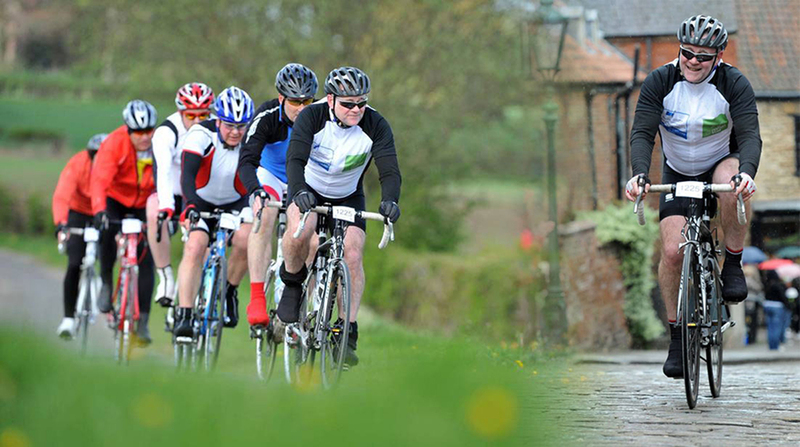 The Sportiv is 100mile cycle through the Lincolnshire Wolds and cobbled streets of Lincoln City. The leader of our pack is pictured, below, leading the pack, and coming up the grueling cobbled incline of Michaelgate, that runs along side Steep Hill, before crossing the finishing line in the centre of Bailgate. We’re hoping to attract more members for our cycling club and support Mark next year. A Remarkable Piece of Print for a Remarkable Building. 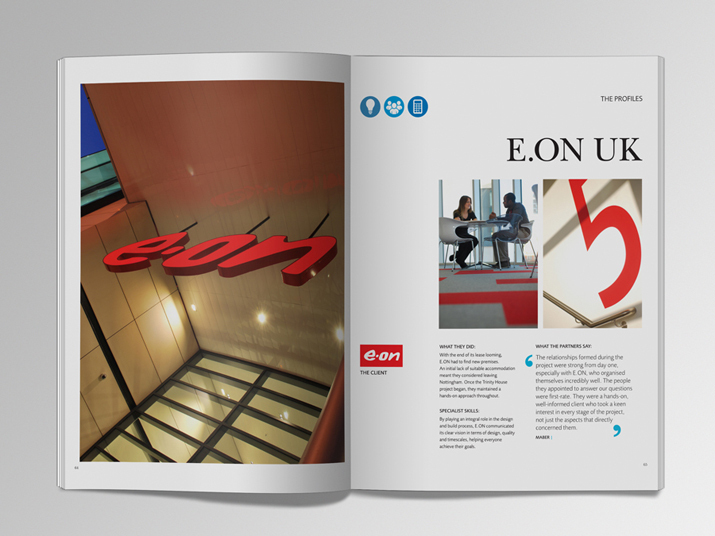 Trinity House is Nottingham’s newest flagship building for E.ON. Trinity House will hold ‘BREEM’ Excellent accreditation and Energy Performance Certificate rate of ‘A’. 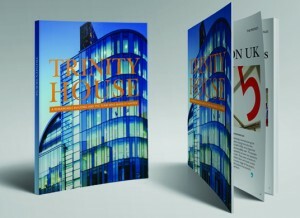 Grade ‘A’ and ‘Excellent’ are two terms that can be applied to the gorgeous tactile brochure we produced for Trinity House. Every print project undertakes a unique path from initial conversation with the client, through to completion and beyond. 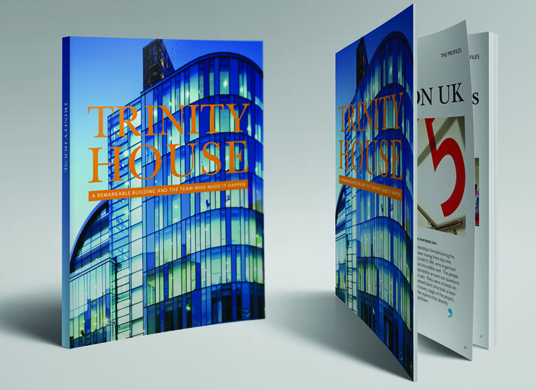 The process of bringing the Trinity House brochure to life was particularly interesting and makes a compelling case study, of how to do things right. However the cases curled within a 24-hour period. Having not experienced this phenomenon before, we had to go back to the drawing board and identify what caused the curling. Over a 6-week period we produced several prototypes. Using different materials for the case covers, case boards and endpapers (changing weights / grain directions and leaving them in different environments i.e hot / cold to see if this also had an effect). Our extensive research pointed to the Colorplan material being the root of our problem. Having used Wibalin on previous case bound books, we recommended to the client that Wibalin needs to substitute the Colorplan, and provided them another prototype using the Wibalin. Once the case bound sample was approved, we then amended the artwork for the deboss on the case cover so it was central from spine to fore-edge and amended the flat size and individual panel size of the dust jacket whilst also re-positioning the spot UV varnish area. 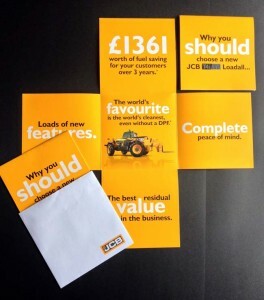 The mailer was printed on 300 gsm FSC® Credited Silk, ensuring that the JCB yellow matched, throughout the run, and to previous work, highlights the benefits of our stringent quality control procedures. Equally our keen eye for detail ensured the die cutting was precise ensuring the mailer folded neatly, and fitted snugly into the envelope we produced.